Sixteen years ago today, I spent my first day as a full-time professional comedian. 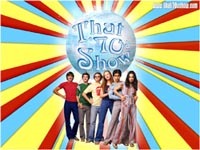 Today I was sitting at Table Read of next week’s script for “That ’70s Show”. I am guest starring as The Milkman. The kids try to hustle me out of milk crates so they can put record albums in them. Ashton Kutcher poses as a cop who says he needs to confiscate them because they are evidence in a murder case. I don’t fall for that. But I do go hook, line, and sinker for the wiley womanly ways of Laura Prepon. She distracts me by hitting on me and holding me close, while the others steal me blind.